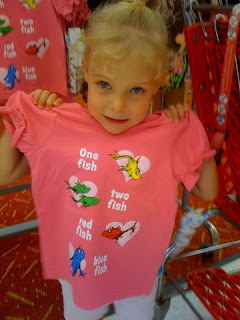 Sierra is a little Dr. Suess fanatic since her birthday. Grandma Sue and Grampy got her a bunch of D.S. books so now she has the cuteness factor and the rhymes to go with it. Her favorite is "Khaki the Hat" (Cat in the Hat). She swears that's his name and if you try to correct her, she gets really mad so...Khaki the Hat it is. She just picked up this little number at the store with Daddy this week just to support her love of books. You had a birthday, shout HOORAY!